WST-1 Cell Proliferation Assay Reagent | Cell Biolabs, Inc. Cell Biolabs’ CytoSelect™ WST-1 Cell Proliferation Assay Reagent provides a colorimetric format for measuring and monitoring cell proliferation. The 10 mL volume is sufficient for the evaluation of 960 assays in ten 96-well plates or 192 assays in eight 24-well plates. Cells can be plated and then treated with compounds or agents that affect proliferation. Cells are then detected with the proliferation reagent, which is converted in live cells from WST-1 to the formazan form in the presence of cellular NADH and an electron mediator. An increase in cell proliferation is accompanied by increased signal, while a decrease in cell proliferation (and signal) can indicate the toxic effects of compounds or suboptimal culture conditions. The assay principles are basic and can be applied to most eukaryotic cell lines, including adherent and non-adherent cells and certain tissues. This cell proliferation reagent can be used to detect proliferation in bacteria, yeast, fungi, protozoa as well as cultured mammalian and piscine cells. 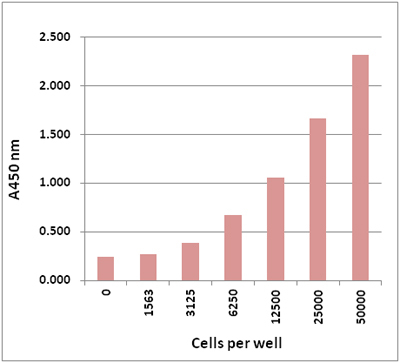 Figure 1: Human HEK 293 Cell Density. HEK 293 cells were seeded at various densities indicated above and allowed to grow for 24 hours. After adding the CytoSelect™ WST-1 Cell Proliferation Assay Reagent, cells were then incubated for 2 hours at 37ºC and 5% CO2.